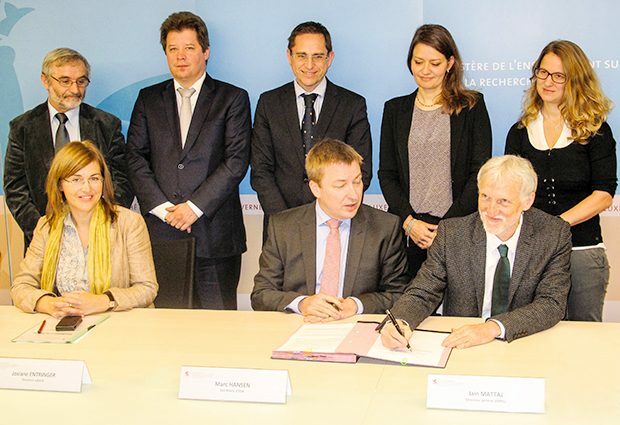 At its meeting in November, the EMBL Council – the institute’s governing body, formed by representatives of its member states – gratefully accepted a special contribution of €500,000 granted by Luxembourg for a third round of calls for joint research projects between scientists from EMBL and Luxembourg in 2015. The decision to fund this third call – announced by the Luxembourg government last month – follows the venture’s success over the past two years. The project selected in this year’s call is a collaboration between Francesca Peri’s lab at EMBL Heidelberg and Alexander Crawford’s team at the Luxembourg Centre for Systems Biomedicine, to investigate the molecular roots of epilepsy. Using advanced microscopy techniques to study the brain of zebrafish with epilepsy-like features, these scientists will focus on the role of microglia – cells that ‘clean up’ dead neurons and other debris in the brain – in the onset and progress of seizures. Already under way is the project selected in the first call, in 2013, which focuses on the complex networks of molecules that interact with each other inside yeast cells. This project draws on the genomics expertise of Lars Steinmetz, Associate Head of EMBL’s Genome Biology Unit, and the knowledge of enzymes and metabolism amassed by Carole Linster’s lab at the Luxembourg Centre for Systems Biomedicine. Their aim is to identify points in these networks which, when manipulated, could cause changes in features such as the cells’ ability to grow in different environments. In the long run, such ‘intervention points’ could prove key for developing personalised medicine approaches, where treatment is tailored to individual patients’ genomes and history.